And now, in Traffick, these five are faced with the toughest question of all: Is there a way out? How these five teenagers face the aftermath of their decisions and experiences is the soul of this story that exposes the dark, ferocious underbelly of the child trafficking trade. Heartwrenching and hopeful, Traffick takes us on five separate but intertwined journeys through the painful challenges of recovery, rehabilitation, and renewal to forgiveness and love. All the way home. To be honest, it’s been a long time since I read Tricks. I remembered the premise, but not all of the characters or what happened. So, jumping into Traffick – it was hard to keep all of the characters straight until about halfway through the book. I probably should have made myself a key so I could remember everything. The best way to sum it up is a novel about lost kids finding their way back home. I liked it. 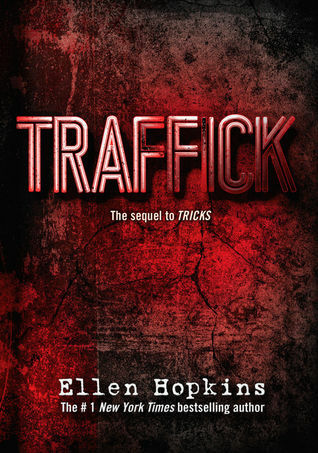 It’s always nice to jump back in to an Ellen Hopkins book with her unique writing style. They’re deep, they hit hard, but they stick with you and are easy to get through. It would be easy to leave this universe and stick with just two books, but I wouldn’t mind another book showing if they can really integrate themselves back into their families after spending time turning ‘Tricks’ in Vegas. The addiction and the PTSD are interesting storylines that could be further explored, and I think Ellen Hopkins would do a great job writing it.